In our current political moment, we are faced with the real and pressing demands of a Trump presidency. In the calls for and urgency of protests, direct action and resistance, there is also a critical need to center and create spaces for healing, care, and community that can collectively and creatively sustain ourselves and our movements. 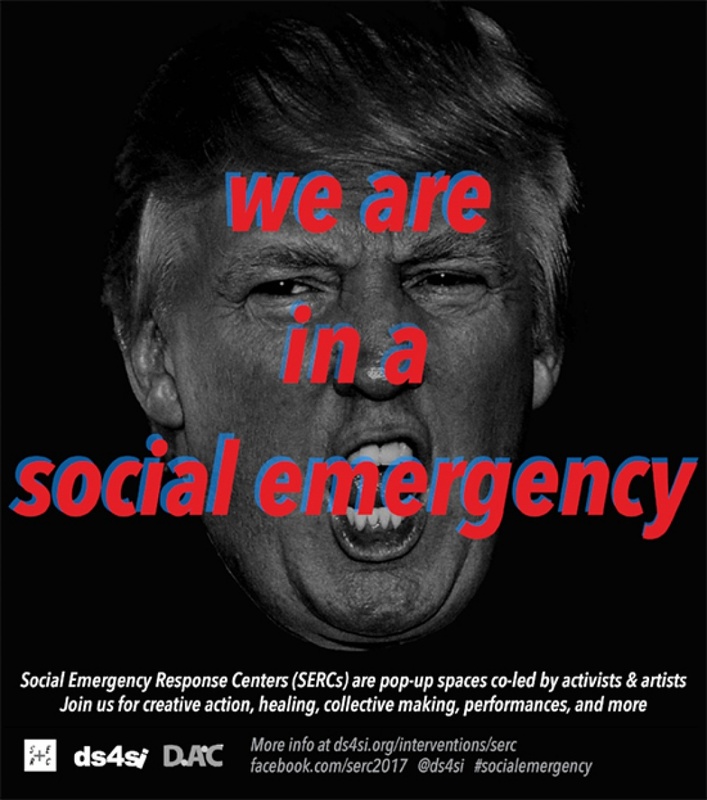 This proposed initiative in response to the current political situation is the Social Emergency Response Center (SERC) launched by the Design Studio for Social Intervention (DS4SI). Our goal is to use the working group model provided by the SoA as a format for collaboration for designing the experience of the SERC(s). The SoA working group is a space for discussion, experimentation and it can take many forms; at its most basic it is a group that comes together around a theme, practice, or project and meets periodically over the course of 3 months to create a final product / project and present it at the SoA quarterly meeting. 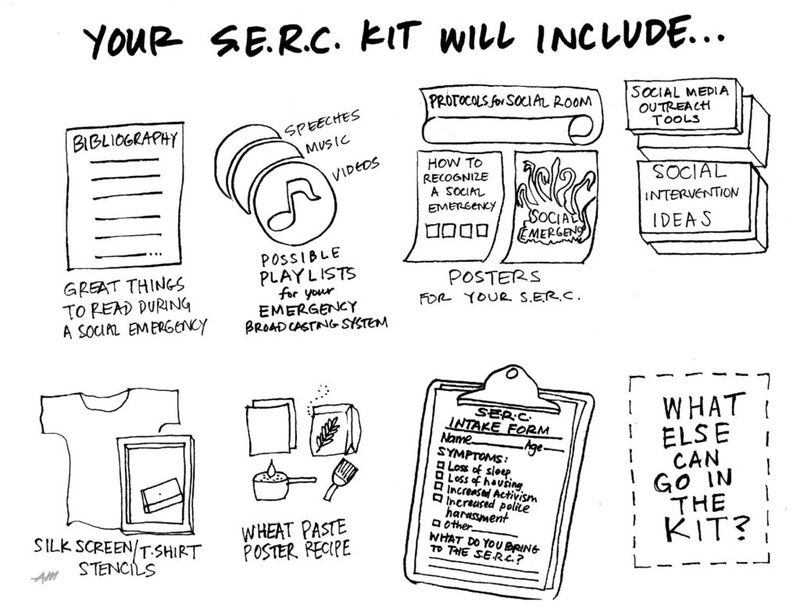 What does a SERC look like? 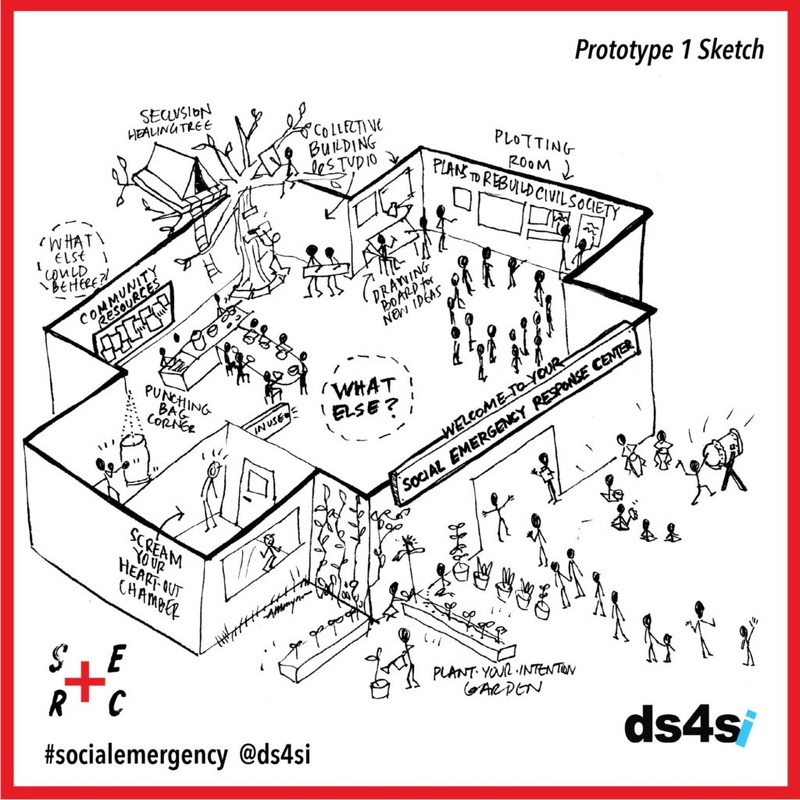 Building on this model of a emergency response center, what would a SERC look like? and how would it function in the context of NYC? and in conjunction with the School of Apocalypse program as a working group? Representing rapid response infrastructure, resources or interventions, what could we imagine creating and deploying to “fill in the gaps”? How could we experiment with ways of providing, supporting, making connections and modeling practices of collective care? Healing: How will it provide collective and individual healing opportunities? Shelter: How will you welcome and protect people’s whole selves? Information: What information will you provide? Their accompanying “starter kit” provides a template of resources to get started with and build from: ranging from a reading list for the social emergency to silkscreen/t-shirt stencils, posters/branded messaging (protocols, watch lists, etc.) to a SERC intake form/form collected from participants (sample question: “What are your symptoms? Loss of Sleep, Loss of Housing, Increased Activism, Increased Police Harassment, Other,” Check All That), etc. Strategic ways to engage the public – go directly to the people? stations in public space? hosting at different locations/businesses? a moving SERC? Create ownership – individual and group contributions and take aways? How to make a space dynamic that reflects those holding space? Strategic partnerships -people and places, volunteer acquirement. Innovative design for the 4 parameters (food, shelter, healing, and information) for programming – For example technology for healing, food for social justice, entertainment for organizing. 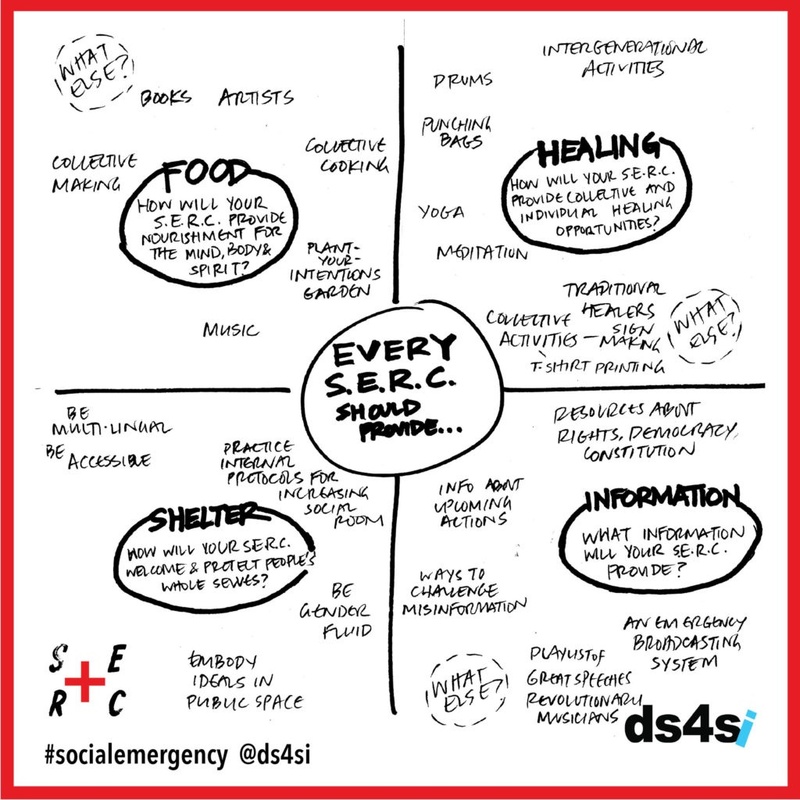 As a framework initiated by the DS4SI, SERCs are temporary, emergent, and creative pop-up spaces co-led by activists and artists around the US. Launched as a pilot in Boston, the broader aim of the project is to encourage SERCs to pop up all over the United States within the first 100 days of Trump’s presidency. It can be flexible and customized depending on each one’s community context–ranging from anywhere from 3 days to 3 months, every day or every weekend in any sort of facility where the public is welcomed. Here is a brief video of the premiere of the February SERC https://vimeo.com/202131746 at the Dorchester Arts Collaborative Boston. Sample programming included Storytelling into Weaving, Taiko Drumming, Dance Class and various forms of activities related to healing, movement and artistic practice. Also includes performances including music and dance, speakers, presentations and film screenings. They also provided special programming for Black History Month.